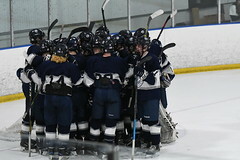 In his final high school game, Dan Latham registered 46 saves on 49 shots, but even that was not enough as Yarmouth’s season was ended by a speedy, skilled Greely squad, which picked up a 4-1 victory. Greely will face Cape Elizabeth in the Class B South Final. From the opening face-off, it was clear that Greely was going to focus on Cooper May and deny him time-and-space. 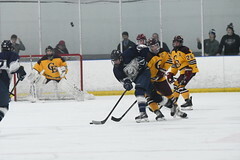 Throughout the game, May attracted a Greely defender whenever he touched the puck. The opening period was a struggle for the Clippers as they were outshot 15-2, but Latham’s heroics were enough to keep the score 1-0. The second period was better for the Clippers as they began to play more physically and started to develop some offensive opportunities. Greely extended the lead to two goals at 3:22 into the period, but Yarmouth cut the lead in half less than three minutes later. Dom Morrill made a nice outside-inside move to get to the net. A loose puck in front of Greely’s goal led to a mad scramble and Michael Guertler was able to poke the puck past the Greely netminder. Suddenly, the Clippers had some life and they were entering the third period trailing by a goal despite being out-shot 27-11. In the final period, Yarmouth struggled to develop sustained pressure or puck control in Greely’s zone as they searched for the tying goal. 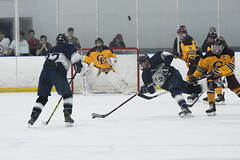 With less than four minutes left in the game, Greely scored on the power play for a two-goal lead and added an empty-netter in the last minute for the final 4-1 score.